Johannesburg - South Africa face four "hellish challenges" on a tour of Europe that will decide whether this season is a success or failure, say coach Allister Coetzee and skipper Eben Etzebeth. The twice world champions Springboks tackle Ireland in Dublin this Saturday, followed by France in Paris, Italy in Padova and Wales in Cardiff on consecutive weekends. Ireland have won four of the last six home Tests against South Africa, France four of the last five, Italy the last, and Wales the last two, leaving the tourists extremely wary. Last year, South Africa fell to England, Italy and Wales to finish 2016 with a calendar-year record eight defeats, triggering media and public calls for Coetzee to be axed. The 54-year-old former coach of Cape Town-based Super Rugby outfit Stormers survived a disastrous first year in charge to achieve better results this year. 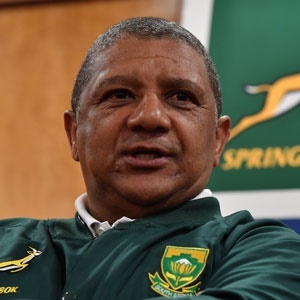 South Africa arrived in Europe at the weekend after five wins, two draws and two losses, but many still question whether Coetzee is the right man for the job. He will probably need at least three victories on tour to silence his critics, and dare not fail for a second successive time against European minnows Italy. Lock Etzebeth, passed fit after injuring an ankle in training two weeks ago, said "the success or failure of our season hinges on what happens in Europe. We are looking at four wins. "When the Springboks played in Europe last year we had not been together for long. Now we have been together for almost two years and are very prepared. "We need to start winning away as a group," he said, referring to only one victory on the road in nine attempts since Coetzee succeeded Heyneke Meyer. Coetzee admitted that the Tests would be "hellish challenges as we have not performed well in Ireland, France and Wales of late and everyone knows what Italy did to us last year. "Playing in Europe means different weather, different styles of play and different interpretations of the breakdown laws by referees. "Our opponents are likely to be very good at tactical kicking and challenging for the ball in the air. "We need to start winning close matches, too, having failed to do so three times this year against New Zealand and Australia." South Africa recovered from a 57-0 mauling by world champions New Zealand in Auckland to lose 25-24 in a Cape Town Test they could have won. The same applied to two draws against Australia - 23-23 in Perth and 27-27 in Bloemfontein - with the Springboks finishing both on the offensive. Earlier, South Africa achieved a 3-0 whitewash of tired, weakened France and triumphed home and away against Argentina, who have slipped since coming fourth at the 2015 Rugby World Cup. The general view of the South African media ahead of the European tour is that the pack should hold its own, but the backline lacks the x-factor that could decide a tight tussle. Tighthead prop Wilco Louw was the find of the domestic season and the only concern is the lack of a specialist and experienced number eight with skipper Warren Whiteley injured. Jan Serfontein was omitted as he wanted to settle at new team Montpellier so Test-rusty Damian de Allende is the lone recognised inside centre among 15 backs. There have also been media hints of a change at flyhalf with fit-again Handre Pollard possibly replacing talented but erratic Elton Jantjies.